JUNIOR ASSOCIATION: Bendigo, Warnambool & Melbourne (Victoria). INTERESTING FACTS: Deanna started playing in the WNBL for Melbourne Tigers when she was 15 in 1995.Go for 2&5 Perth Lynx team mate Emma Pass played in the England All Star game together on the same team!! One of her seasons overseas in Siberia, nobody spoke English and the coldest day was about - 40 and on average it was -25. 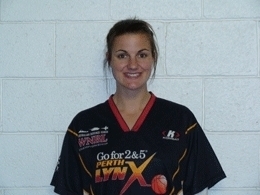 WNBL CAREER NOTES: Deanna averaged 21.7 points and 5.7 rebounds per game in her last season in the ADF WNBL in 2005/06. She has played 10 years in the WNBL. She has won WNBL Championships in 1998/99 (AIS) & 1999/2000 (Canberra). Deanna returns to the Go for 2&5 Perth Lynx after three years overseas. GENERAL BASKETBALL CAREER NOTES: Deanne represented Country Victoria at U16 (1995), U18 (1996 & 1997) Australian Junior Championships and Victoria at U20 Australian Junior Championships. Vic Country was U18 Champions in 1996 & 1997 and Deanna was captain in 1997. She was All Australian in 1995, 1996 & 1997. She has played basketball in England, Portugal (Portuguese Champions), Russia (Siberia) and Italy (Northern). Deanna went to America and Korea with AIS. She represented Australia in 2002 (South East Asian Games) and has been an Australian Opals Squad Member from 2005-2008. Her Basketball highlights are her first game for Australia and winning the AIS grand final. PERSONAL INFORMATION: Deanna’s favourite basketball players are Penny Taylor, Lauren Jackson, Manu Ginobli and Steve Nash. Her favourite foods are ice cream, Allen’s Lollies, Pretzels and Fruit & Vegetables! Favourite movies are The Castle, How to lose a guy in 10 days and all Adam Sandler & Denzel Washington movies. Favourite Actors are Denzel Washington, Adam Sandler, Julia Roberts and Drew Barrymore. Music Preference is RnB, Old School Music and acoustic. Personal Interests include spending time with people she loves, going to the beach, going to the movies, meeting new people and seeing new places. Deanna ALWAYS wears odd socks and doesn’t like pasta but likes pasta sauce. Hi Deanna, great to have you on myFiba. I look forward to reading more news from Perth in 2009. Good luck with the rest of the season. Great work with the myFIBA page....Go Lynx!! !